Barbara Dewey and Loretta Parham join 50 other librarians, including Tracie Hall, Emma Bradford Perry, and Hannelore B Rader, to explore one of the major issues facing the profession - diversity. This innovative guide explores how librarians can ensure that their services, staff, and collections truly reflect our multicultural society. Chapters cover strategic planning; recruiting and retaining minorities; reaching out to new users; marketing to underrepresented populations; building collections for marginalized groups; overcoming the digital divide; assessment; and other important topics. The contributors provide numerous forms and documents including library diversity plans; residency and intern job descriptions; recruitment materials; programming plans and documents; and web resources. 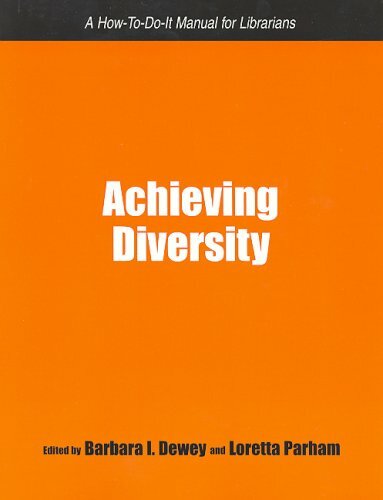 With guidance drawn from real experience in public and academic libraries, this unique guide will help to make diversity a reality in libraries.